PhD student Rodell Barrientos shares his project "Ozone-Induced Dissociation as a Straightforward Technique for Identification of Glycolipid Molecular Species." Students from more than 30 departments made 89 presentations, and six were recognized as winners of their categories. Winners of these $1,000 awards were chosen for their clarity of communication to a non-specialized audience, effective presentation skills, content knowledge, creativity, organization, originality and their ability to explain why this research and work matters. Judges included members of the Board of Trustees, local officials, leading executives, alumni and other members of the regional community. Marya Fancey, in the Arts category, for “Understanding Sacred Organ Music from a Sixteenth-Century Polish Source.” To continue her research, Fancey will travel to Poland in the coming year. Ho Young Lee, in the Health Sciences category, for the project “Doxorubicin-Induced Cytotoxicity in Rat Myocardial H9c2 Cells: The Roles of Reactive Oxygen Species and Redox Balance.” Doxorubicin is an extremely effective anticancer drug, but can cause irreversible damage to the heart. Lee’s research investigated mechanisms behind the Doxorubicin-induced cardiotoxicity. Luciana Lilley, in the Humanities category, for “Cannibalism Does What?! in George Thompson’s ‘Venus in Boston’?” Lilley’s research contemplates “medicinal cannibalism,” represented through the early 19th-century American novel, and in Early Modern medical literature. Taylor Mabe, in the Natural, Physical, and Mathematical Sciences category, for the project “A Point-of-Care Biosensor for Disease Diagnostics,” which explores the possibility of creating palm-size sensors that detect biological molecules. The small sensor device could be used to screen for diseases, particularly in remote locations and in urgent situations. Justin Larson, in the Professional Programs category, for his project “North Carolina’s Clean Smokestacks Act and Emissions, Untangling a Tangled Relationship.” Larson used Continuous Emissions Monitoring System data to find out if the Clean Smokestacks Act caused a reduction in emissions of sulfur dioxide and nitrogen oxides from coal-fired power plants in North Carolina. Tiffany Merritt, in the Social Sciences category, for “What Influences if a Death Row Exoneree Receives Financial Redress?” Merritt built her own database for information about extra-legal factors that may reveal discriminatory practices in the criminal justice system, with regard to the likelihood of exonerees receiving financial redress. 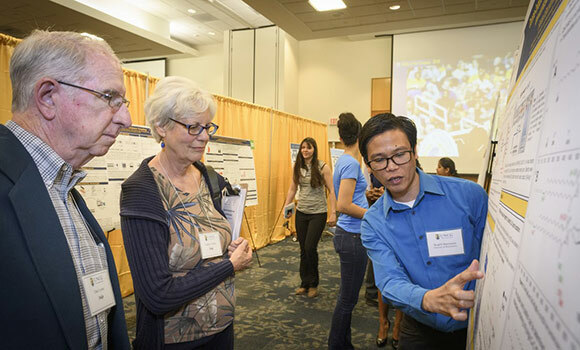 Vice Chancellor for Research and Economic Development Terri L. Shelton noted that, as UNCG students develop as active researchers, it is crucial for them to be able to communicate the quality of the research to those outside their discipline and to the public. The event was sponsored by the UNCG Graduate School in partnership with the Office of Research and Economic Development. See more at the UNCG Graduate School website.